What made the experience of listening to ITSM: QuickStart Guide the most enjoyable? IT Service Management is a general term that describes a strategic approach for designing, delivering, managing and improving the way information technology (IT) is used within an organization. This audiobook provides the listener with a basic overview of ITSM, covering all of the necessary concepts and components of an effective ITSM system. I am a retired IT professional and got this book to help give me an overview of the discipline such as it is. Fairly thorough across the industry. Didn't really spend so much time on the ITSM as on ITIL and even other standards. Nice overview of all the 'alphabet soup' of the discipline. Narrator was professional in tone and very appropriately articulated the text. I was given a free copy of this audio book for the purposes of providing an honest review. Would you listen to ITSM: QuickStart Guide again? Why? Yes. This is a true intro to ITSM. This book provides the meaning to the acronym and it dives into ITIL in one of the chapters. This book is a really good start to understanding ITSM. The way the book ties ITSM, ITIL, and Six Sigma together is really good. IT is more than software, hardware, and security, this book shows how IT and Operations go hand in hand. The way this book ties ITSM and ITIL together and breaks it down. I would have if I had time. I had to stretch it out over 3 days. “Full Disclosure: I received this book for free in exchange for my honest and unbiased review”. I would recommend this book to all friends. Where does ITSM: QuickStart Guide rank among all the audiobooks you’ve listened to so far? This audiobook give a great overview of ITSM. Especially useful is the contrast/comparison between several ITSM frameworks like ITIL, Six Sigma, ISO20000, etc. Technical books are always hard to convert to audiobooks because there is a lot of dry detail. I think that the narrator was fine considering this caveat. Full Disclosure: I received this book for free in exchange for my honest and unbiased review. 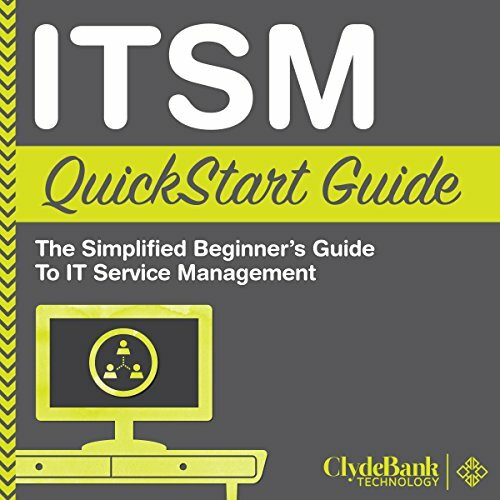 This quickstart guide is great for beginners - people starting in ITSM and people with some interest who know nothing about ITSM. I fell into the latter category, my wife and a couple friends work in ITSM so I downloaded this guide to see if it would help would help give me a rough understanding of that aspect of their lives. It did give me a much better understanding of the various aspects of what they do by providing a technical/systematic overview of the field and discussing some of the personal, social, and experiential facets of working in ITSM. It also introduced me to a side of business that I expect will be helpful to me as an aspiring entrepreneur. The examples were useful and inserted with just the right frequency, and the narration was fantastic at engaging beginners enough to draw them into some of the interesting nuances of the field without being overly technical or pretentious. The publishers also offer a satisfaction-or-refund guarantee so there's not much to lose. Bottom line: a good place to start in the ITSM literature, well worth the current price of $5. Great for someone who has to work with IT! Would you consider the audio edition of ITSM: QuickStart Guide to be better than the print version? I haven't read the print version, so I can not answer this. I work a lot with IT departments, though not for one, so this was great to help understand why things are done how they are. Additionally, it helped me to identify things that our IT department could improve on if they followed the standards better. What does Peter Bierma bring to the story that you wouldn’t experience if you just read the book? His inflection is great and helps make it easier to understand, though sometimes a little slow, so I listened at 2x speed. I received this book at little or no cost in exchange for my HONEST, UNBIASED review.